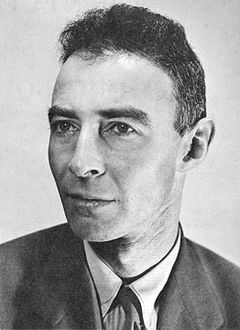 Julius Robert Oppenheimer[note 1] (Aprile 22, 1904 – Februar 18, 1967) wis an American theoretical pheesicist an professor o pheesics at the Varsity o Californie, Berkeley. As the wartime heid o the Los Alamos Laboratory, Oppenheimer is amang thir wha are cried the "faither o the atomic bomb" for thair role in the Manhattan Project, the Warld War II project that developed the first nuclear wappens uised in the atomic bombins o Hiroshima an Nagasaki. ↑ The meanin o the 'J' in J. Robert Oppenheimer haes been a soorce o confusion. Historians Alice Kimball Smith an Charles Weiner sum up the general historical opinion in their volume Robert Oppenheimer: Letters and recollections, on page 1: "Whether the 'J' in Robert's name stood for Julius or, as Robert himself once said, 'for nothing' may never be fully resolved. His brother Frank surmised that the 'J' was symbolic, a gesture in the direction of naming the eldest son after the father but at the same time a signal that his parents did not want Robert to be a 'junior.'" It is not Askenazic Jewish custom to name children after living relatives. In Peter Goodchild's J. Robert Oppenheimer: Shatterer of Worlds, it is said that Robert's father, Julius, added the empty initial to give Robert's name additional distinction, but Goodchild's book has no footnotes, so the source of this assertion is unclear. Robert's claim that the 'J' stood "for nothing" is taken from an interview conducted by Thomas S. Kuhn on November 18, 1963, which currently resides in the Archive for the History of Quantum Physics. On the other hand, Oppenheimer's birth certificate reads "Julius Robert Oppenheimer". This page wis last eeditit on 17 Julie 2016, at 21:03.